Oil. People tend to think of a black, thick, icky, substance extracted from the ground. The word is usually associated with the natural resource, a resource becoming scarcer with time. It’s rarely associated with sublime panoramic landscapes, grandeur, beauty, and emotion. Edward Burtynsky’s Oil exhibition depicts the oil industry in a whole new light, making something bland seem so beautifully powerful. In his new exhibition at the McCord Museum, Canadian photographer Edward Burtynsky explores the world of oil and everything it touches. This exhibition consists of 56 photographs that are unexpectedly fascinating and powerful. As someone who has visited the exhibition, I can honestly say that his art is mesmerizing. The pieces are bursting with life, colour, intricate detail, and precise lighting, which altogether blend into very busy but pleasant images, all connected by one theme: oil. There are photographs of large machinery, pipelines, large barren fields of dirt, and oil pumps. They capture the immensity of the industry, the process, the impact it has on our world today as well as in the future. I’ll admit I was unsure about the exhibit at first. I had never expected it to be so moving and beautiful. Burtynsky’s photography explores oil sites using several aerial shots as well as high-rise views, allowing us to see the vast, even unfamiliar, landscapes. As uninteresting and colourless as this might sound, Burtynsky manages to capture the main features of these industrial oil sites while also capturing beautiful skies, mountains, and clouds in the background. Each moment is precisely chosen to create the best and boldest image possible. The beauty of nature at a distance is a recurring theme throughout the exhibition, contrasting the rather repulsive and dirty oil sites with a quiet and sublime beauty. The photographs are truly beautiful and make us think about what we are actually seeing: oil, something not so magnificent, suddenly becoming amazing. 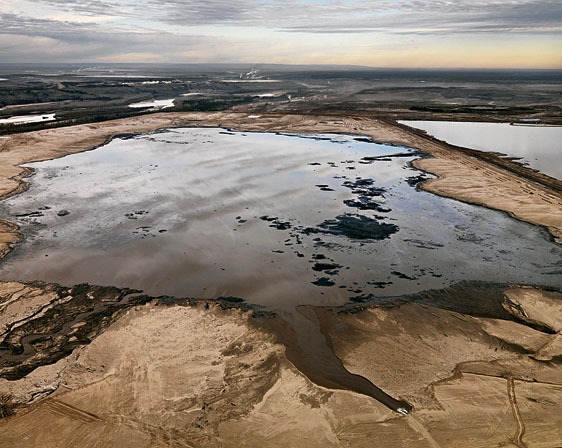 Burtynsky’s photographs of oil spills are possibly some of the most eye-catching ones in the exhibit. The light shines perfectly onto the ruined landscape, the sky in the background is magnificent. You cannot help but stare, in awe, before realizing what you are looking at: massive environmental damage. It is shocking how I did not feel disgusted or angry, instead I felt at peace and even pleased by the photograph. It truly is beautiful, even if we do not think it should be. The reaction to this unconventional beauty becomes confusing, going against our usual negative reactions towards oil spills. Massive photographs of thousands of cars lined up in a parking lot, never-ending piles of tires, complex highways covered in traffic, piles of dirty trash compressed into cubes, all very overwhelming and shocking photographs, that are once again appealing in a sad and uncomfortable way. I found myself staring at a pile of tires, unable to look away. It is an unusual yet attractive sight. My gut feeling tells me these photographs should be scary and disturbing, depicting what oil has brought to the world, including the pollution and problems it has caused. Instead, it is captivating. The exhibit is showcased at McCord museum until January 8, and I highly recommend it to anyone interested in seeing something fresh and surprisingly touching. Burtynsky’s photographs show us what is happening to our landscapes and what the future might hold for us. The fact that Oil achieves this through beauty and breathtaking views is very powerful. The large dimensions of the photographs emphasize the unavoidable impact oil has in our society. The increasing pollution is an inescapable truth once you enter the exhibit. A truth that, if you are willing to face, becomes remarkably beautiful in its own way. Erika Métivier is a second year Literature student. She has a passion for great literature, dance, and music. She loves exploring her creativity in every way possible, whether it be through writing, dancing, or cooking something wacky for supper. She often spends too much time up late at night, finishing homework. This is mostly due to her amazing procrastination skills, a constant desire for perfection, and a prioritized love for reading which often takes over homework time. Her main source of energy in these moments consist of Nibs, Peanut M&Ms, and Cadbury Mini Eggs. Above all, Erika loves to talk and laugh. This is something really interesting, turning something that is supposed to be “ugly” into something so eye-catching. We now see how much oil spills like this are having such a negative impact on the environment and how terrible it is for the land and the surrounding people. It always seems to be a negative thing, so i like that there can always be something positive like these beautiful pictures to bring some sort of light to the topic. I care a lot about the environment, i have even given some money towards charities to help clean up the oil spill that happend recently in the gulf coast. So even though this is something that is upsetting, these pictures look really nice and I think it would be interesting to see this exhibit. Thanks! This is a great article written about a great photographer. His work truely is amazing, captivating and it makes you truely see that even with our world being destroyed by such things like oil and tires, there is still a beauty in seeing it. Most people when they hear that they will be seeing a photograph of a landfill or of a oil spill they will think that the photograph will automatically look depressing and have some sort of birds being covered in oil; but Burtynsky shows us a different take. He shows us that this can be beautiful in his large prints and that he was a very talented man. Burtynsky’s goal was to take landscapes and make them beautiful even in the worse conditions. Like any artist he did not want to show the bad side of a tragety but he wanted to show the beauty in our world and how you can take a horrible thing and make it look stunning. I was really happy to stumble on this article because I heard about Burtynsky’s Oil exhibition but completely forgot about it. So I was happy that your article reminded me to not miss it. Furthermore, the great comments made me want to see it even more. At first, I wanted to see more pictures but then I realized that buy not showing to many pictures, it does not spoil our experience at the McCord Museum. The only thing I think that could be missing would maybe be a link to the McCord Museum’s website and maybe a little tip on how to get there. But other than that, good article ! Burtynsky’s photographs are highly interesting. On an aesthetic level, they’re pictures of oil in surreal, vast open plains. However, on a thematic level, what can Burtynsky be implying? Perhaps the meaning is, as you suggested, that increasing pollution is inevitable as a result of oil, which has extreme artistic potential- so might as well show the true beauty of it. This is fascinating; you can take anything, no matter how negative it’s social implication is, and turn it into remarkable art. Maybe his photos are supposed to me more of social commentary, though. Or maybe it’s just meant to be pretty. Either way, the relationship between oil and art hasn’t been previously explored much and the fusion between the two is awesome to witness. You did a great job at describing the formal aspects of the photographs and what they might mean. This article is very interesting and mind blowing at the same time. Society really does not know how bad oil is impacting our environment, however we need more photographs like these ones to show the world we need to change the way we live and to use oil more efficiently. The tire picture really touched me and it’s not only a beautiful picture but also it can relate to every human being walking on this earth. Burtynsky’s photography hits the viewer in a very positive way, even though the pictures are disturbing in many ways, the affect it has on people can make a difference in our world.